Me too. But sometimes they really come together. The absolute soulful majesty of my 1940 Epiphone Triumph, in terms of looks, sound, and feel...That one has it all. I noticed some of those as well, Strum. The headstock is weird - especially with that cut out on the trouble side, but we'll see. Looks like you could hang it from a peg! I guess the Eastwoods are fine as long as you buy them for looks. The majority of their customers probably never played the "original version" of their Eastwood, and are just fine with what they got. I have a '56 Supro Dual Tone I bought back when they were realistically priced, and The Eastwood version might be a fun guitar, and good looking, but a Dual Tone it's not. Which is fine, unless that is what you were really after. I just stumbled across this conversation, and I can take a stab at clearing up a few things concerning my former association with J. Backlund Design, Retronix, and my current arrangement with Eastwood. Retronix was the brand name of J Backlund Design's import line of guitars, which were Korean-made versions of two of my guitar designs, the rather bland R-800 offset, and the more distinctive model 100. I don't know for sure precisely how many R-800's were made, but the first crowdfunding effort done for it was fairly successful and perhaps as many as 150 or so were sold that way. Only four Retronix model 100's were made as sales and promotional examples. I have one of them, the other three ended up in the hands of Mark Slaughter, Kimberley Dahme (when she was with Boston), and Andre Maguera. Retronix also sold a number of R-800B bass guitars, but again, I don't know how many. The bass version of the R-800 was 95 percent the work of Bruce Bennett, my contribution to that model was really only the offset model 800 body profile. In my almost ten year association with the J Backlund Design company, I doubt if more than fifty guitars of mine, of all types, were built and sold. In that entire time, I received a grand total of a one-time payment of $500. I wasn't being cheated, because I know that nobody else associated with these guitars was making anything on them either. I retain the legal ownership of all my guitar designs, and about a year and a half ago, I terminated any further business association with JBD/Retronix and forbid them from making or marketing any further import versions of any of my guitar designs. I did, however, agree to allow them to continue to make several of my designs as custom-ordered only, US built instruments, as I had zero personal interest in continuing on with expensive boutique-priced guitars, and they would not compete directly with any future import versions being offered at one fourth to one third the price of the original JBD customs that had eventually risen to the $3500-$5000 price range. After I terminated my association with JBD/Retronix, I decided to 'move on' from guitars and pursue other interests, but as a last ditch effort, I thought I would take a long-shot and see if I could get a few model 100's crowdfunded on my own. I had posted some feelers on several guitar forums to try to gauge the potential interest in a $600 Backlund model 100, knowing that at that price, I would barely break even, or perhaps actually lose money, but at that point, I really didn't care, and just wanted to get a few more of them out into the world, maybe profits could come later with other models. I know now that this idea was doomed from the start, there was just no way I could reach enough potential buyers to make it work. Eastwood came into the picture shortly before my independent model 100 crowd-funding program was to start. Mike Robinson had been made aware of my Intentions to attempt the crowd-funding thing myself and contacted me. He knows the business and can make things happen, and knew that my chances of success were small to none, and I knew he was right. I had met Mike Robinson at the winter NAMM show several years earlier when he and an associate stopped by the small JBD/Retronix booth that they had there that year. Unfortunately, my association with JBD/Retronix at that time precluded any dealings with other parties, so nothing was to come of that meeting, other than perhaps the planting of the seeds of a future involvement, which finally came to be a reality after ending my business arrangement with JBD/Retronix. Eastwood has literally resurrected my guitar designs from the ashes, I was more than ready to walk away from them and forget them, but there they are, being built and selling. They certainly aren't for everyone, and will always be a small part of an already small niche market, but at least they're being made, and I'm finally even making a few bucks on the deal, which is an entirely new concept to me, and one I could get used to. I receive a specific royalty percentage for every guitar of mine that Eastwood sells. My arrangement with Eastwood is on- going, and holds the potential for many more of my guitar designs being offered through them in the future. Bruce Bennett and I have our differences, and there exists a measure of ill will between us, but he and I started the whole thing around 2005 from a few pencil sketches of some crazy guitars posted on the old Harmony Central electric guitar forum. As for JBD/Retronix, I have no idea what they are doing these days, but the company's other two principals, Kevin Maxfield and Steve Lewis were never anything but fair to me, and they both busted their butts trying to make the company successful, but it apparently wasn't to be. The guitars of mine being offered by Eastwood are made by the same Korean company that makes Reverend, Italia, and has more than a passing relationship with Duesenberg guitars, and I've been very pleased with the results. It's true that I do not construct the guitars I design, I am not a luthier or guitar tech, but I am smart enough to delegate the technical stuff to those who know a lot more abut those things than I do. I have a vision for these things and 'create' them on paper and computer. I am a player however, and currently own about seventeen guitars, with more on the way. Right now, I'm infatuated with my new Taylor 254CE 12 string. This being a Gretsch forum, I probably shouldn't mention that I traded in my Gretsch G100 on the Taylor, but I'll be buying other Gretsch guitars in the near future. My favorite guitar is still my 2002 MIM telecaster. John....thanks for posting. That is a very interesting read. I think your guitar designs are very interesting and look forward to your continued success and seeing more of them in the future. keep it gretsch or sleep with the fishes! 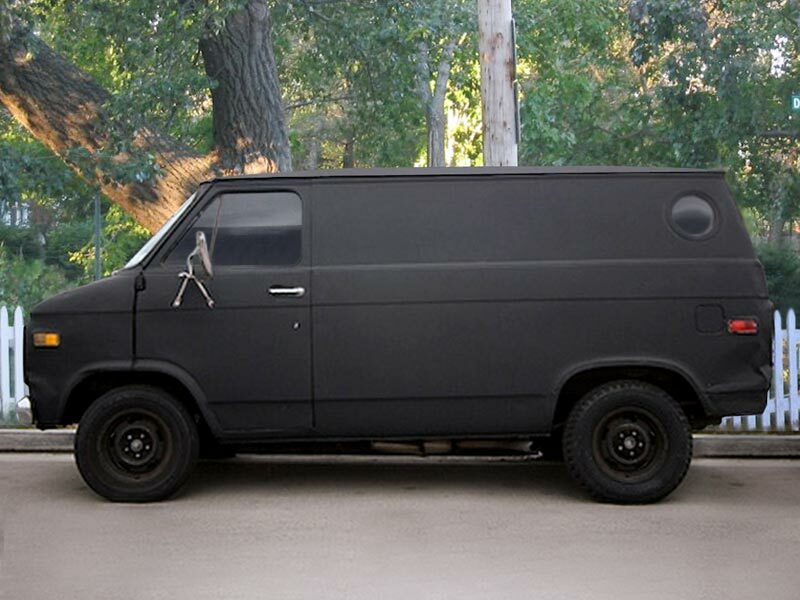 the black van is watching you! Yes, Thank you John for providing all that insight. Good luck with the Eastwood deal. Okay, I'll have to admit, I do like this for some reason. It's amazing to me that only 50 of the original design were sold. I swear I saw ads for those for years. Over all those years, J Backlund Design made my model 100, 200, 300, and 400. I don't know exactly how many 100 and 200's they made, but I doubt that there was more than twenty of either. Only three or four model 300's were built, and either five or six 400's, one of which I own. These guitars were the hand-built customs made in Chattanooga by JBD's luthier, Bruce Bennett. If more 100's and 200's were built than I suspect, it wouldn't be very many, so I'll stand by my total of possibly fifty being built in total. I thought that the 400 would never be built as a relatively affordable guitar. The Import version still isn't exactly cheap, but considering that the five or six U.S. built 400's that exist were priced between $4000-$5000, it's not too bad. I'll be getting a metallic red/cream example of it myself, then I'll have the world's largest collection of Backlund model 400's.....Three. One Chattanooga-made JBD-400, one Eastwood Backlund model 400, and the rarest 400 of them all, an illegal, Chinese-made knockoff that I was able to buy. Apparently, they found that it was too difficult for them to make in any numbers and only built one example. It's a piece of crap, but a fascinating one, at least to me. If I were a guitar, I would be this. And I would love me. I'm personally in love with Eastwoods version of the Backlund 100 guitar. It's pretty much the only one I have considered actually buying in the last 5 yrs. Something about the shape and appointments at it's price point is just intriguing for me. The only other Eastwood that I ever liked and wanted was their Copy of the Eko Rocket..I would have bought that one if they had continued it. I tried to be fair in my appraisal of Eastwood guitars and business model in my longer post away upthread (though my opening salvo was snarky). I hope it reads that way. I do understand the economic and technical reasons Eastwoods are as they are. Vince's, Mel's, and Walter's comments are all true in their own ways. Collectors of the quirky marginal brands Eastwood specializes in are not fooled, either the guitars serve the needs of individual buyers or they don't, and there's no harm in any case. We can buy or stay away as suits us. Since the thread started I've had experience with several more Eastwoods, and - to the issue of quality - all have been superbly well made, apparently with fine quality control. Two are sonically distinctive and with plenty enough unique vibe to keep me entertained and musically satisfied every time I play them. 1st class stuff, with minimal mods needed. The other is as well made, but doesn't light me up as much, and will be moving along. In the process, I've had nothing but positive interactions with Mike Robinson. He's treated me very fairly. Good guy. I continue to watch the brand for interesting offerings. Thanks to John Backlund for providing background and insight here - certainly more than he had to do. I still admire his designs from a purely aesthetic point of view. I had the Eastwood Model 100 for a time, and it was a sleek, well-made instrument. Tonally, it was ... neutral, I guess. Exactly what you'd expect from its scale length, material, and pickup choices: a clean slate rock guitar with even response across the neck. You could amp and pedal it to purpose. Ultimately it didn't work for me, and for a reason that should have been completely apparent from the first time I saw it: with no lower shoulder or other protrusion in that quadrant, and the sleek slope of the bottom profile, it just wouldn't stay on my lap. I couldn't get comfortable playing it seated - and I rarely play standing. So, stupid me: seduced by a shape again. I thought I was too old for that. One of the other Backlund shapes would suit me better functionally, and I'd have no qualms about Eastwood quality or execution. I like the resurrection of this thread for the simple fact that I adore oddly shaped guitars. I might be in trouble now. Sure turned into the battle of the epic long posts, this thread. Interesting stuff. I've owned a few Eastwoods. Agreeing with Walter on the Tuxedo. Didn't feel or sound quite right. Had an Airline repro from them that sounded amazing but would not stay in tune. The big winner for me is the Sidejack DLX. Strange. Never had a basswood body guitar I could live with, so this is a surprise that way. And in several other ways. First, wonderful P-90 pickups. Not at all what I expected, p/us being typically a weak point in cheap seats guitars. Very smooth, usable trem. Far better than any JM I've tried. Most important to me, it's one of those rare guitars that requires no setup change to serve as an open tuning/slide guitar. I caught the last day of an Eastwood Custom Moderne build yesterday - I was interested enough to plunk a deposit down. I like Buddy Miller. I see there's an Eastwood Buddy Miller model based on BM's Wandre guitar. I have an eastwood 12 string electric, kind of 335ish but brown with filtertron looking humbuckers, Fine sounding inexpensive studio tool.